Notes from the Forest: Act 3 is a magic number — A.B.L.E. Every week, A.B.L.E. teaching artist Emma MacLean takes you behind the scenes for our teen ensembles’ spring production, As You Like It. Click here to catch up on our past installments, and read on to find out about Week 4 of rehearsals. I have to tell you… I’m a sucker for a good dance number. I love seeing a whole cast break into choreography. In traditional practice, all Shakespeare shows finish with a jig. So, not to spoil anything, but there will be some dancing at the end of As You Like It. This week at the end of dance party we learned the steps to that dance. 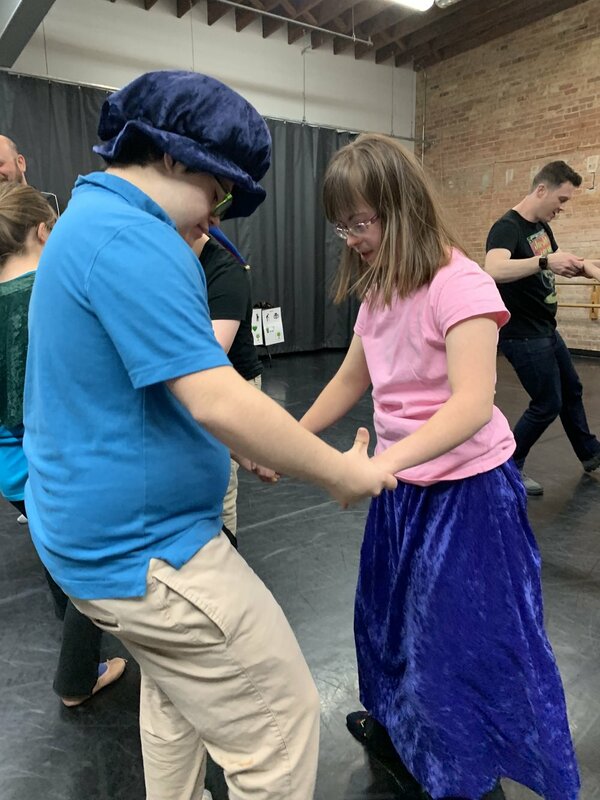 It was fun to dance with lots of different partners. After refreshing in our minds about the events of Acts 1 and 2 with a game called Pearls on a String, we worked our way through Act 3. Love is in the air in Act 3. Rosalind (disguised as Ganymede) is with Orlando when Phebe shows up professing her love for Ganymede, and Silvius trails behind her professing his love for Phebe. The four go around and around. The Friday ensemble acts out As You Like It’s major love quadrangle with Mila as Silvius, Natalia as Phebe, Samuel as Orlando, and Quincy as Rosalind/Ganymede. Notice the signature costume pieces for each character - these help us (and the audience) to keep track of who is who. It is one of my favorite scenes in the show, each character is more madly in love with the next. And then… Oliver pops back up in Act 3. Remember him? He’s Orlando’s mean older brother, but Oliver has a change of heart after he is almost eaten by a lion! Orlando swoops in and saves the day (and gets a nasty arm wound). Oliver takes one look at Celia (disguised as Aliena) and he is madly in love with her! Finally, Ganymede (really Rosalind) brings everyone together. And as she promised, she “magically” transforms herself back into Rosalind. All the couples are with their right counterpart and all is well. And then there is much dancing! After we finished our play plot, we got to work with puppets. Each class is going to be using puppets in a different way in the show, which means from here on out, Monday and Friday classes will be using different puppets in rehearsal. Friday’s class combined their work with focus and breath, and brought their trash bags to life while acting out a little story. Monday’s class did some work with our fabric puppets (keep your eyes peeled, they might just come back for the show…) Groups had to work together with someone on the head and arm, another on the arm and back and a third on the legs. There was some awesome teamwork happening. We have some beautiful woodland creatures, a marionette lion, and scrappy bunraku-style wrestler on loan from puppet designers Cynthia Von Orthal and Stephanie Diaz. Over the weekend, our facilitators got together for an extra rehearsal to play with all of the puppets and choreograph some of the larger moments. I can’t wait to see what our actors do when they start working with them! And with that, we’ve worked our way through the plot of the whole show! I’m excited to dig into puppets this coming week, and then it’s time for auditions! The show will be here before we know it! We can officially announce that we are teaming up with our dear friends at Chicago Shakespeare Theater for As You Like It, which will be staged Monday May 20, 2019 in the Courtyard Theater. Tickets will be available next week. If you’re not already, sign up for our newsletter you can get first dibs! Newer PostAt the Movies: Here's looking at you, kid.